I did it myself!!! Wahoo!!!! Ok, enough of that, right? Colored this Riley, which I received from my good friend Stacy, with SU markers. I added crystal effects to the watering can. The flower is actually a sparkly pink brad that I received from my "big flower". The watering can and shovel also have silver metallic gel pen on them. I love this fold ~ I took a regular card then trimmed 1/2 and inch from both sides and the bottom. So where you see the polka dot dp, that's actually the inside of the card. The front flap lifts up where the scallops are ~ cool, huh? I like it. Ok, it's getting late! See ya! card info: stamps ~ Riley, stitched bg (on turquoise layer). paper ~ pink, rose red, turq, dp, ww. ink ~ black, white craft. access. ~ markers, punches, ribbon, gel pens, crystal effects, brad. Here's a set of cards that I was inspired to make after browsing Michelle's blog ~ yep, another case! 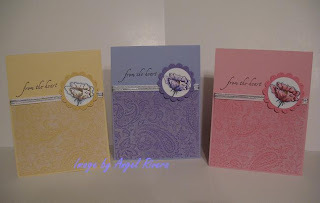 I love this little trio of cards ~ perfect for spring and the sentiment "from the heart" is perfect for so many occassions. 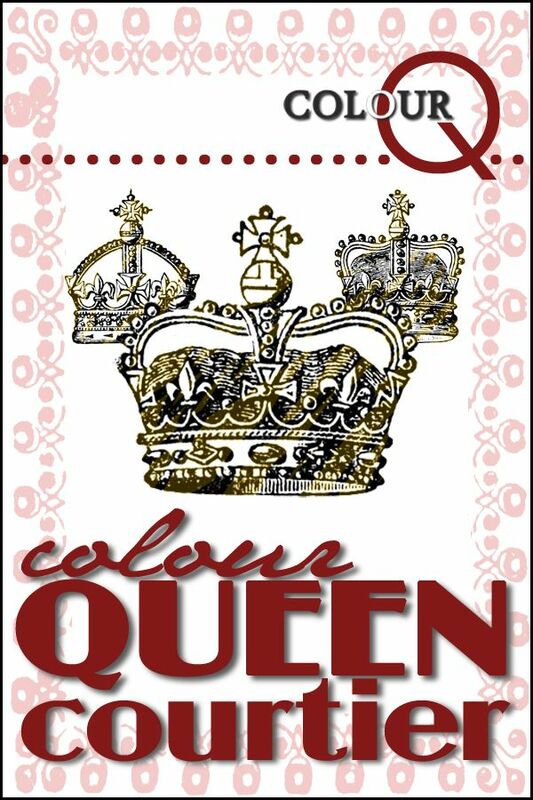 The color combos I chose were: banana/saffron, amethyst/lilac, pink/regal. All of the bottom layers were stamped with the Paisley bg stamps using white craft. As you can see, I highlighted all around the flowers using the bashful blue marker. It really helps the flower *pop*. After being able to stamp so much today, I just feel like taking a deep breath and saying "aaahhhhhhh" ~ it was a nice, relaxing day. Hope yours was, too! card info: stamps ~ bloomin' beautiful, paisley, holidays and wishes. paper ~ banana, saffron, amethyst, lilac, pink, regal, ww. ink ~ black, white craft. access. ~ ribbon, silver cord, punches, markers, piercer. 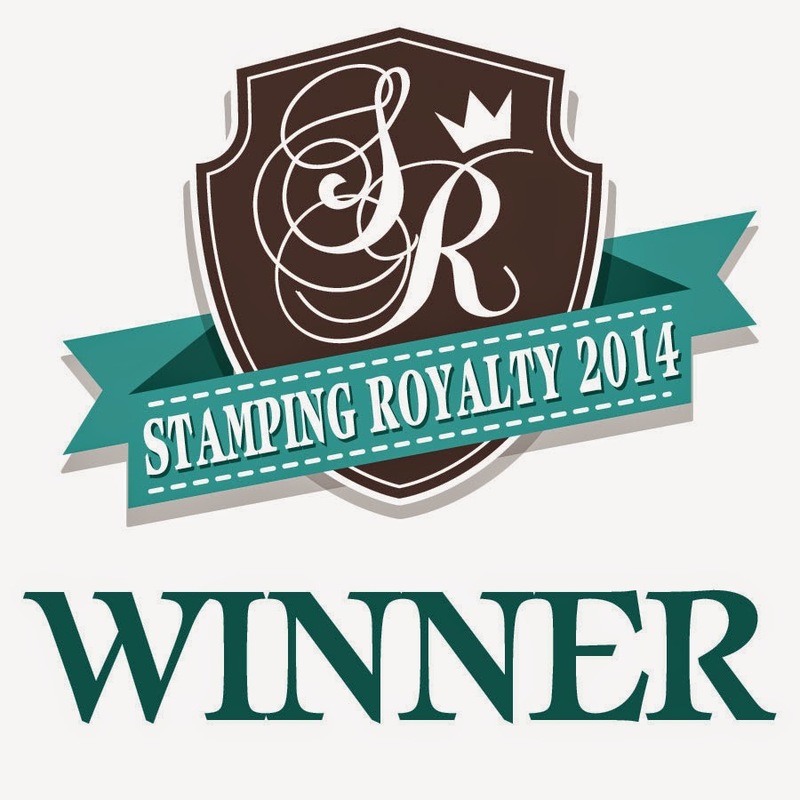 Today's Featured Stamper is Michelle! Yay, got a card done on time for a change! 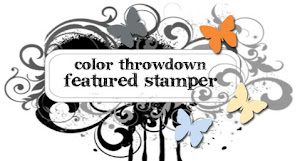 The featured stamper was Michelle, sf9erfan on SCS. 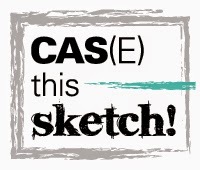 Awesome gallery ~ go check it out! To me, the Bloomin' Beautiful set calls for elegant dp, but I decided to be a rebel (oooohh, I'm such a bad a$$, hehe, just kidding!) and use some funky dp with it instead. I think it works! What do you think? Very simple card ~ used only black ink and colored in the flower w/ SU markers. Added some piercing and a little ribbon and organdy. Voila! card info: stamps ~ bloomin' beautiful, blooming with love. paper ~ ww, regal and dp. access. ~ markers, piercer, grosgrain, organdy. STAMPS AND STUFF FOR SALE!! Ok, thought I'd list some sets I'm ready to get rid of. All sets are in great condition. Sassy Stems ~ $16 ~~~~ SOLD!! Shipping is not included in the price. I'm willing to negotiate if you buy more than one item. Here's the card I did for this week's Sketch Challenge. If you've never checked out Michelle Zindorf's work (zindorf on SCS), RUN to her gallery now! She is a true artist! 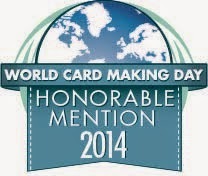 This card was heavily influenced by her work. What'd I do? I took 2 pieces of Soft Sky cs and first brayered with Sky ink. Then I brayered them with Blue Bayou and just kinda kept going back and forth until it blended well and there were no obvious lines. I then stamped an image from Garden Silhouettes in black and highlighted parts of the flowers with a white gel pen. The sentiment is from the Gina K set, Make a Wish. I split it up and made the "peace & comfort" part of it a focal point by putting it in a hardware frame. I also stamped the same flower on that sentiment panel in Sky, plus I sponged it with Bayou. The larger Bayou panel was sponged w/ Bayou ink and the card base was sponged with Sky for some extra "depth". Ok, after a long, HOT afternoon of watching 2 of the boys play baseball, I'm pooped! Going to go relax now and hopefully stamp later! Have a great weekend!! Funny title, I know! 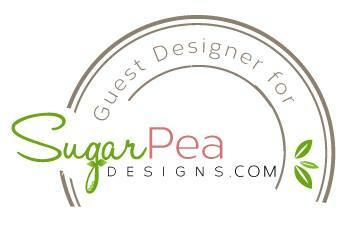 But that's what this weeks' Color Challenge on SCS was ~ pretty in pink, certainly celery and chocolate chip. I made 4 cards for the combo, but his one is my fave, I think. Simple, but still sweet and pretty. I colored the heart from the Always set with markers once, then stamped it on pink using chocolate ink so that I could cut them out and layer them. The swirls behind the heart are from the Priceless set. I double stamped the sentiment ~ once in chocolate, then again in pink. Added piercing around the border and she's done! Thanks for stopping by! 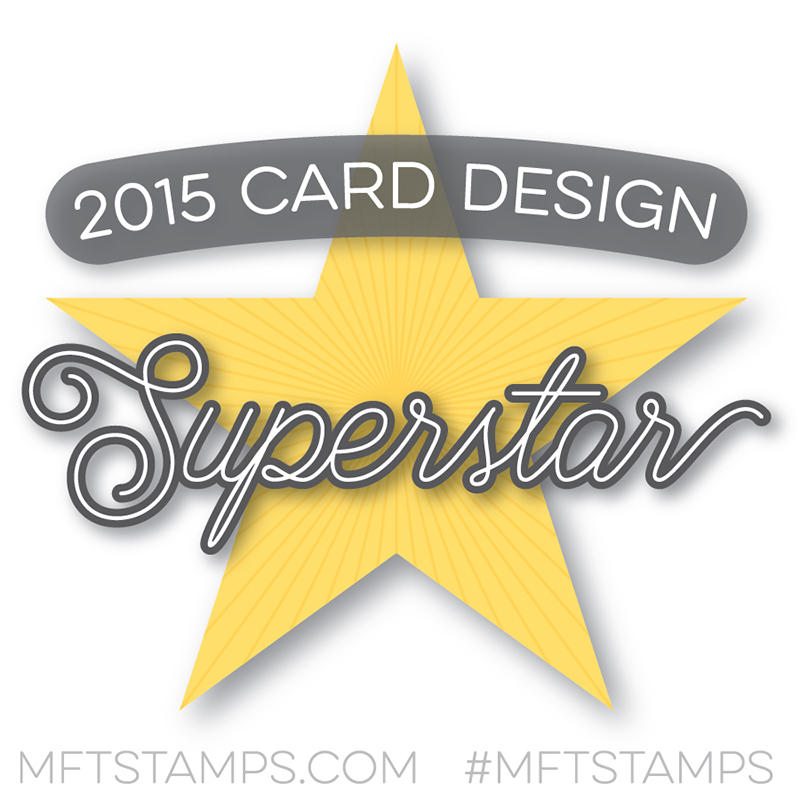 card info: stamps ~ Always, Priceless. paper ~ pink, ww. ink ~ choc, pink. access. ~ markers, piercer. It's been 3 whole months since my brother passed. Seems like yesterday. It hurts just as much as it did 3 months ago. I still don't want it to be real. Thought I'd share a pic of him. 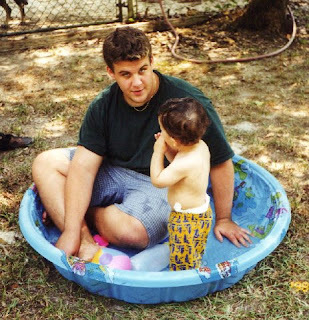 I love this pic because it really shows how much of a big kid he was, getting in that little pool with my oldest (who was 1 then and now is almost 11!!). I still have not made peace with it and don't know if I'll ever be able to. Sorry for not posting in a while, a little thing called *life* has kept me busy. Here's the card I did for this week's CC ~ blush, guava and basic grey. Such a pretty combo. The flowers have stickles all over them and I finally used some of the square brads I've had for years! I used one of the small stamps from the One of a Kind for the border around the card base, then highlighted it with a white gel pen. I decided to leave off a sentiment so I could use it for any occassion. card info: stamps ~ bloomin' beautiful, one of a kind. paper ~ blush, basic grey, guava, ww. ink ~ guava, basic grey. access. ~ markers, brads, ribbon, stickles. card info: stamps ~ bud basics, baroque motifs, bloomin' with love. paper ~ brocade, ww, black. ink ~ black, brocade, celery, green galore. access. ~ coluzzle, piercer, sponge, buttons, brads. Alright, sorry I haven't posted in a while! Kind of a crazy week and weekend between baseball games (3 during the week and 3 on Saturdays!) plus a 5 hr visit to the ER (not to worry, everyone's fine now! ), time just gets away from ya! I did start the flowered panel on Sat. and just never did anything with it once it was colored. 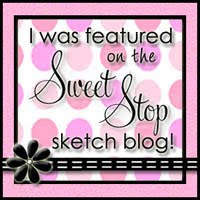 Then I saw the TLC on SCS and Julee's Mojo sketch challenge on her blog (go check it out!) and I suddenly felt inspired! Love it when that happens! I used a black ribbon and white organdy for the TLC, which was to use stacked ribbons. I wanted to use up the last of my black vintage brads, but didn't think they'd stand out very well, so I sanded them to help them show up. I pierced along the larger kraft panel, then sponged the edges w/ black ink. And I must say, kraft is really easy to blend colors on (easier than plain ol' white paper), almost like watercolor paper. I love all the layering on this, especially around the sentiment. Well, I gotta get some things done and prep for 2 baseball games tonight! AAHHH! And they're at the same time, fortunately their fields are right next to each other. card info: stamps ~ embrace life, paisley, hugs and wishes. paper ~ red, kraft, black, ww. ink ~ red, black. access.~ ribbon, organdy, brads, prima, sponge, piercer, markers.